Jonathan is a young boy who feels he’s not good enough as he is. One day, while playing alone in his backyard, a magnificent cardinal reveals to Jonathan a hidden path and leads him to embark on an adventurous journey. Along the way, he stops by a still pond where he throws pebbles into the water and is intrigued by the magical ripples they make. Following the bird, Jonathan comes to a crystal cave where a unique and wise lion teaches him about colorful rainbow tools and the power of pebbles tossed in a pond. Jonathan’s experience with the lion leads him to a powerful discovery which changes his outlook about himself and about life. 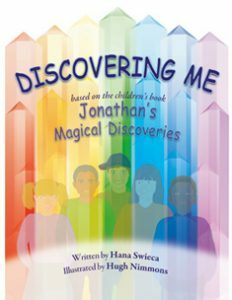 Jonathan’s Magical Discoveries, a children’s story for all ages, is an enchanting journey of self discovery, which increases self-esteem, touches on many personal challenges children go through daily and empowers us to take action to reach our goals and dreams. 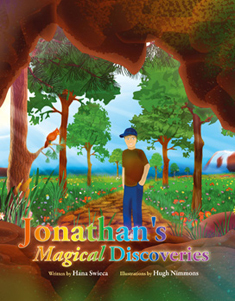 This companion to the children’s book, Jonathan’s Magical Discoveries, is a creative-learning activity book, designed for children to integrate the ideas from the story, into their own lives, as they set out on a playful journey of self discovery. This book includes questions, guided imagery exercises, affirmations, creative activities, and a game. This book encourages children to help themselves and learn their part in making positive changes while empowering them to reach their goals and dreams. Children learn how to overcome fears, raise their self esteem and confidence level, identify their feelings, learn how to express themselves, stand up for themselves, look at their thoughts, tap into their intuition and more. Kidz Mpowered also offers an 8 week group program called Discovering Me for ages 5-6 and 7-12, which is based on these books and is designed to empower children to overcome many personal challenges and teach them how to reach for goals and dreams. All orders will be shipped by Canada Post unless informed otherwise. Kidz Mpowered ships all orders to the address specified at the time of purchase. Kidz Mpowered accepts no responsibility or liability for goods not received as a result of an incorrect address provided by the customer. We are located in Montreal – Quebec, Canada, and we ship to Canada, the US and overseas. DELIVERY TIME – Please allow between 5 – 6 business days for delivery within Canada and approximately 10 business days for delivery within USA (after parcel is shipped). Orders shipped to overseas locations may take longer due to customs inspection. The delivery time might be longer during the holidays and special dates.